I really, really enjoyed this. Unlike Strange Angels it started with good momentum and kept it up throughout, incorporating some standout action scenes. Dru was slightly down beat but I felt this was to be expected considering everything that’s happened recently and gave it a sense of realism. Christophe was still intriguing but I want to see more of him in the next book otherwise I think it’s just going to become annoying – there are so many questions that need answering. I absolutely loved how Graves progressed in this – he was adorable in the first book but after this one he’s fast becoming my favourite character and I love his relationship with Dru. There are also some other characters that are introduced – Dibb’s was my favourite of these (very sweet!). I find the mythology created here is fantastic – but it can get a bit confusing at times to keep track of all the different things – so a glossary would really help keep it all straight! The ending was good and although it's not strictly a cliff hanger ending the book does feel like it's Part 2 of a longer story. Overall I really enjoyed it and this is becoming one of my favourite series. 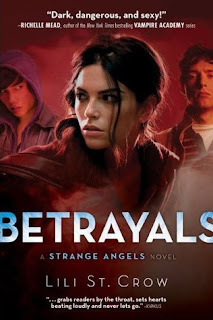 I’ve been surprised by people's disappointment with the first book (Strange Angels) and am wondering if this is going to be one of those series you either love or hate? I love it and can’t wait until July when Jealousy is released.